I use to tell people to be careful setting goals because they could kill you. Goals can become the monkey on your back that drives you to do things maybe you shouldn’t be doing. I would classify myself as being very goal oriented. Having a to-do list and checking things off gives me a sense of accomplishment. Lately, I have started wondering about this whole goal thing. I joined the 50 State Half Marathon Club last year and signed up for the 50 State Endurance Challenge. This challenge allows me to count both marathons and half marathons towards my goal. I have been plugging along, checking off my states (23 so far). But my goal of completing endurance races in all 50 states is nothing compared to the goals of some people I have met over the last few years. They make me look like a loser. 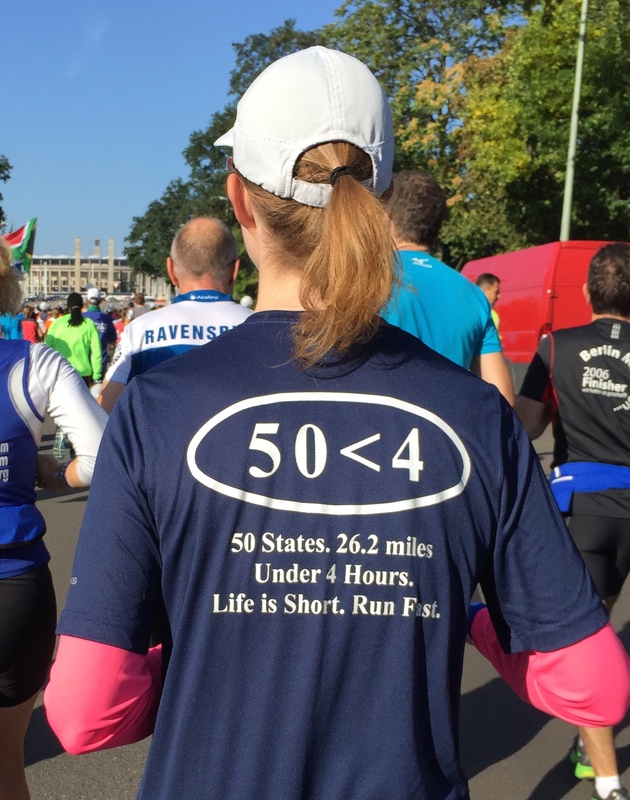 I have met runners with variations on the 50-State-goal theme. There are people who want to run marathons in all 50 states. Then there are those people who want to run marathons in all 50 states but complete each race in under 4 hours (as if running marathons in all 50 states wasn’t hard enough). They even have their own club – 50under4. In Atlantic City, I walked from the hotel to the start line with a man whose goal is to run a marathon AND a half marathon in all 50 states. I don’t think there is a club for that one. 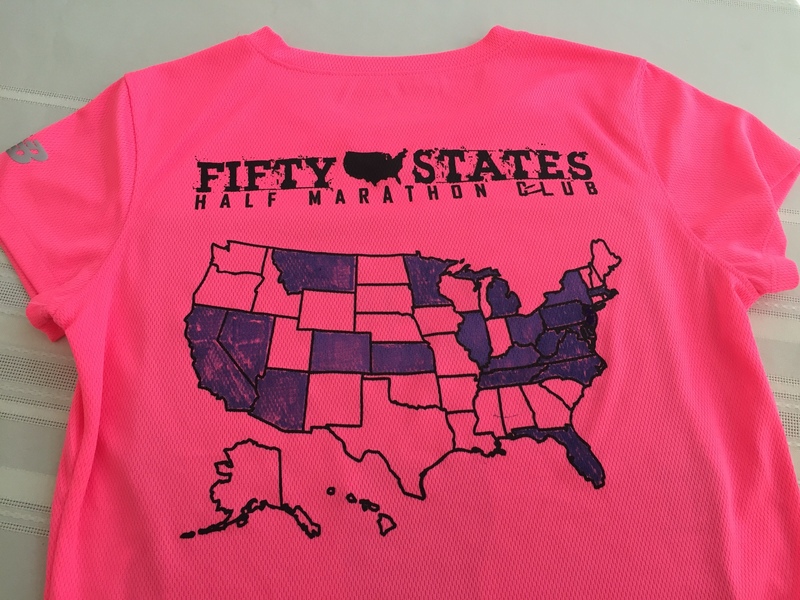 I met a man who has a goal of running a half marathon in each of the 50 states. He added the personal challenge that he has to finish each race in under 2 hours. He is moving along on his goal and has over 30 states checked off. It would be a bit higher but some of the races he completed in over 2 hours. He won’t count those states towards his goal and will have to go back to run in them again. Doug Kurtis had a unique personal goal. I met Doug in Duluth, Minnesota in 2013 when I ran the Grandma’s Marathon. While waiting for the bus to the start line, Doug started talking to me. He pointed to his bandana that had “200” written across it. He was 61 years old and was hoping to run his 200th marathon in less than 3 hours that day. Unfortunately, the weather didn’t cooperate and he didn’t make it. He finished in 3:05:23 (I would have been overjoyed to run a marathon that fast). A few months later, I read about him in Runners World magazine. He was able to reach his goal at his hometown race, the Detroit Free-Press Marathon. It is a very impressive accomplishment. There are runners who have the goal of running the same race every year. Sometimes the races give these runners special names. The Marine Corps Marathon (MCM) calls them “Ground Pounders”. There are only two Ground Pounders left who have run all 40 MCMs – Will Brown, 67, and Alfred Richmond, 74. There are the “Perfectly Goofy” runners who have run all 10 Goofy Race and a Half Challenges at Disney World (half marathon and full marathon over 2 consecutive days). I know some people who want to be “Perfectly Dopey” by running Disney World’s annual Dopey Challenge (5K, 10K, half marathon and full marathon over 4 consecutive days). I was Dopey once and that was enough. When I was diagnosed with Transverse Myelitis (TM), I wasn’t sure I could keep running. I searched the Internet to find other runners with TM and learn how they handled things like running in heat. I found a blog written by Kimberly Kotar who also happens to be the President and Founder of the Canadian Transverse Myelitis Association. Kimberly was a marathon runner when she was diagnosed with TM. Despite her diagnosis, she kept running with the goal of completing a marathon in each of the 10 Canadian provinces. She completed her goal last month. Some runners set a goal to run on all 7 Continents. I had that goal for a while until I realized that, for health reasons, I can’t travel to all 7 Continents. Now I am trying to run each of the 6 Major World Marathons. I might not be able to reach that goal either since I won’t qualify for the Boston Marathon even if I am still running when I am 80. I started questioning the focus on my goals after reading “How to Fail at Almost Everything and Still Win Big” by Scott Adams. Scott thinks “goals are for losers.” According to Scott, if you set a goal, you spend all your time working on getting to that goal and that gets tiring. Ask Doug Kurtis – after he reached 200, he stopped running sub-3:00 marathons because it is a lot of work to run that fast. Scott also points out that if you don’t reach your goal, then you feel like a failure. Who needs the emotional baggage that comes with that? I chatted with Cathy, my hair stylist, about goals as she cut my hair today. I have known Cathy a long time and she always provides wise advice on things like this. Cathy told me that she thought goals were good because they put you on a path to where you need to be. She pointed out that my original goal back in 2007 was to raise money for the Leukemia & Lymphoma Society by running a marathon in honor of my friend, Marnie. After that, I kept running and set the goal of running 5 full marathons and 10 half marathons by the time I turned 55. I did that with 6 months to spare. She watched me deal with my TM diagnosis 5 years ago. Running, she pointed out, is keeping me healthy plus I am having fun traveling to races. My original goal – running to raise money for my friend – put me on the path to something so much bigger. Score 1 Cathy. Scott, however, points out the same thing that I realized when I read the definition of goal. There is an “end” when you are talking about a goal. There are only 50 States, only 7 Continents, and only 6 World Majors. When you have run all those, what do you do next? Is it time to hang up your running shoes and turn off your Garmin for good? I remember when I was working in the business world they sat us down at the beginning of the year to define our goals and objectives. It was a very formal process where everyone signed a document like a contract. The whole thing had a lot of negative connotations to it. If the regular goals weren’t enough, they added stretch goals. I felt compelled to meet those along with the already challenging regular goals. Periodically I would pull out the document with my goals to see how I was doing. I would get stressed out over the goals I knew were impossible to reach. Then at the end of the year, they sat me down to see how I did. Colleagues that didn’t make their goals were put on probation or worse. Somehow I usually came through relatively unscathed. They couldn’t make the work environment any more stressful if they tried. I have been spending a lot of time planning my 2016 race schedule. It is starting to feel a lot like a job. My 50 State goal is getting stressful. I decided today that I am going to look at my running goals differently. I am going to think about them more as aspirations than goals. If I don’t make a particular goal, it isn’t a big deal. I already failed at running the 7 Continents and nobody fired me. I aspire to run all 6 Major Marathons. Maybe I will and maybe I won’t. And maybe along the way I’ll find something even better to do.